ActiveYOUkraine was founded in 2016 as a project to capture the diversity of activism inside and outside of Ukraine. Using the Digital Storytelling method, we aim to give a direct insight into the work of grassroot initiatives, activist groups and organizations in Ukraine. A workshop concept that aims at capacity building among activists, especially concerning digital media skills. A website that acts as a platform for Ukrainian activists inside and outside Ukraine. A growing network of Ukrainian and European activists who are actively exchanging experiences, stories and ideas. Participants write, script, shoot and edit their own digital stories during our workshops. The finished videos will be uploaded on the website activeyoukraine.org to spread the word and reach a bigger audience. 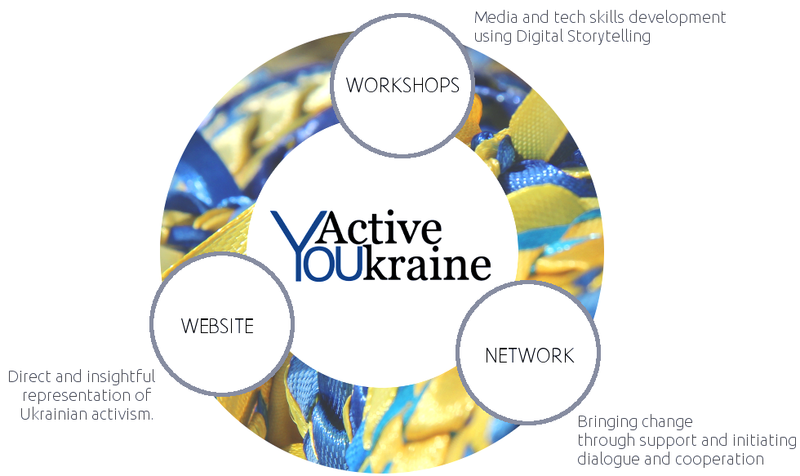 Over time, activeyoukraine.org will grow into a “map of activism” in Ukraine, where people can search and find local or regional initiatives, projects, organizations and get in contact with engaged people. By using a modern and creative approach (digital storytelling), we strive to increase the visibility of Ukrainian activists and their initiatives, groups and NGOS in Ukraine and abroad, and we aim to reach a diverse and international target group. We are part of the interdisciplinary platform UkraineLab curated by Insha Osvita and MitOst, which operates in Germany, Ukraine as well as other East European countries. Our Ukrainian partners are Logos NGO and Society Initiative Institute in Lviv.